I recently consulted a contractor who wanted to implement inbound marketing into his contracting business. Although he is a real person and the following details are real, for privacy reasons I’ll refer to him as, Carl. The gross profit margin for his contracting business was at 40%. That doesn’t tell the entire story, though. When all is said and done, he is only actually netting 5%. With his average contracting job bringing in about $5,000, that’s only a net profit of $250, per job. Let’s say he wanted to invest an additional $3,000 per month into inbound marketing. He would have to sell 12 new jobs just to break even… 24 if he wanted to double his money. I’m not saying this is impossible. It just happened to be unrealistic for Carl, because of his niche, competition, and location. Basically, over the span of a month, Carl is paying about $16.50 per click and $225 per lead… astronomical prices, if you ask me! The gloomy thing is that at only $250 net profit per job, Carl would have to close every single contractor lead just to squeak out a $25 profit on each one. And we all know that isn’t realistically going to happen, right? In my conversation with Carl, I discovered that he felt his prices were a bit low. He was taking on a ton of jobs and keeping his crew busy, but he wasn’t making any money in the process. I suggested what he already knew: Raise prices across the board. With his services already underpriced, Carl could easily raise them by 10% without causing an issue. His average job would then increase to $5,500. However, since his costs to deliver the services wouldn’t be going up, 100% of that extra $500 drops to his bottom line. As a result, his profit would skyrocket from $250 per job to $750 per job. That’s right, an immediate 300% boost in bottom-line profitability! Back to the marketing… Raising his prices would drop Carl’s break-even point from 12 to only 4 new jobs a month; which would be much more realistic for his company. Raising prices was a must if Carl wanted to grow his $2,000,000 company any further. Did you notice what Carl’s conversion rate was on the clicks from his pay-per-click campaign? A whopping 8.3%! Not good. So, let’s say he kept spending the $900 on pay-per-click, but only this time, he did it from an inbound marketing approach. By sending pay-per-click traffic to an optimized landing page, he could increase the visitor-to-lead conversion rate to 32%. Carl would then end up with about 17 leads a month, up from just 4. At this rate, to make his pay-per-click campaign profitable, Carl would only have to close 21% of the leads, as opposed to the 90%. And that’s without raising his prices! If he raised prices, he would only need to close 7% of those leads. Much more doable, right? This is a more favorable scenario because Carl’s average cost per lead would also drop from $225 to just $53, at the same time. Huge savings. Let’s assume Carl’s sales system is streamlined and functioning smoothly. No matter how many leads come in, his team consistently closes a reasonable 25% of them. Without raising his prices or utilizing inbound marketing strategies, Carl would be losing $650 per month, which is 72% on his pay-per-click strategy. On the other hand, if he raised his prices by just 10% and started inbound marketing, Carl would make $2,288, or a return on investment of 254%. A lot of companies I consult with don’t realize there are multiple ways of generating new sales within a single marketing strategy, like I explained in the example above. Yes, it’s great to be ranked #1 on Google for a keyword. But, is that keyword actually driving traffic to your website? Yes, it’s great to get a ton of website traffic. But, is that traffic converting into leads for your sales team? Yes, it’s great to get leads. But, are they high quality and converting into paying customers at a good rate? By making minor tweaks to a single aspect of a marketing campaign or by increasing prices by a small percentage, you can really experience exponential results. And by exponential results, I’m talking about the profitability of your contracting business! Chances are, there are a few hidden gems that you can take advantage of to make the current marketing you’re doing more profitable. Whether you want more leads or just want higher-quality leads, it doesn’t matter… You’ve got to do the math! 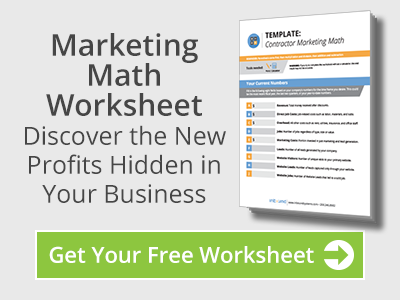 Thanks to Carl, I put together a fill-in-the-blank cheat sheet that you can use for your own contractor marketing math. Download the cheat sheet, fill it out, and let me know what you find. To your inbound marketing success!